The Great Philadelphia Wagon Road is the story of the Scots-Irish settlement in America. North America remained a green wilderness for nearly 150 years. There were only trails cut thorough the forest which spread from New Hampshire to Georgia. The Appalachian Mountains was a stern barrier between the Atlantic and the unknown interior of the continent. The settlers moved inland, and followed paths of the which the Indians had hunted and traded, many of these trails were worn down by the buffalo which once roamed the uplands in search for food. These paths followed valleys and river shores, extended southward to the Carolinas. This movement of families, individuals and communities from one place to another has been the shaping of history. In the eighteenth century migrations few trails in America weren’t more important than the Indian route, which extended to east of the Appalachians from Pennsylvania to Georgia. This Ancient Warriors Path had long been used by the Iroquois tribesmen of the north to come to the south and trade or to make war in Virginia and the Carolinas. By a series of treaties with the powerful Five Nations of the Iroquois, the English acquired the use of the Warriors Path. After 1744 they took over the land itself. The growth of the route into the principal highway of the colonial back country is important in the development of the nation. Over this vast wagon road came the English, the Scots-Irish and the German settlers to claim land. The Great Warriors Path led from the Iroquois Confederacy around the Great Lakes through what later became Lancaster and to Bethlehem, Pennsylvania to York, to Gettysburg, into the western Maryland around what is now known as Hagerstown, across the Potomac River at Evan Watkins Ferry following the narrow path across the "back country" or "up country" or "Piedmont" to Winchester through the Shenandoah Valley of Virginia to Harrisburg, Staunton, Lexington, Roanoke to Salem, North Carolina, to Salisbury, where it was joined by the east–west Catawba and Cherokee Indian Trading Path to at the Trading Ford across the Yadkin River, in Rowan, North Carolina, thence to Charlotte, to Rock Hill, South Carolina where it branches to take two routes to Augusta, and Savannah, Georgia. The Scots – Irish who poured into America from Ulster were middle class farmers and craftsmen who came from poor rural counties of Northern Ireland where English rule had grown increasingly severe and where the 1740 famine in Ulster hastened their departure. They were nearly all Presbyterians. Arriving in Philadelphia, they made their way westward to Lancaster and Harrisburg, thence south over the Warriors Path towards the cheaper lands of Virginia, crossing the Potomac by Watkins Ferry. Wherever they settled they started schools, churches and preached. The Scots - Irish that came to the Colonies were the best educated of the immigrated groups. At the time of the Revolution there were 600,000 Scots-Irish in America and their literary level was the highest it had ever been. As pioneers, the Scots - Irish proved their mettle and arrived when the Colonists needed them. There was little mingling of the people of different nationalities even with people in the communities. The Scots who was transplanted in the Colonies did not intermarry with the English or the Irish catholic. When they came to the Colonies and established their early churches, the Scots did not intermarry with the English or the Palatine neighbors for two generations. The goal of the Scots was to obtain lands, but for the Scot-Irish not necessarily to own it. A common grievance against these Scots colonial authorities was their habit to squatting on the land and not taking claim to it officially. This action supplies one reason why the expected deed records that would prove the migration. Many Scots farmers lacked the skills or the money to adhere to the traditional Ulster way which combined cropping with herding, and hunting and did not require large amounts of the best land and invited the movement as the land and the game wore out. The settlers from Ulster were restless and moved down the Great Philadelphia Wagon Road. As it had been done in Pennsylvania, the Great Wagon Road in the Carolinas and Virginia forced the Indians to move futher westward. Riding along the Great Wagon Road in the decade before the Ameriacn Revolution, visitors from Europe expressed amazement at the rapid growth of the interior. Stretched from Philadelphia to Georgia were endless farms, punctuated by an occasional fort, tavern, or village. By 1765 the Wagon Road was cleared for horse drawn vehicles. To maintain the road, County Courts appointed overseers and viewers, who were responsible for the keeping up with the segments of through fair at the County expense. Packhorse trains vied with wagons as carriers of the frontiers goods, a rider on the lead horse led as many ten to twelve horses in procession, the belled bridle of each being attached to the saddle, of the preceding horse, each horse being equipped to carry up to six hundred pounds. Besides wagoners and packhorses drivers, the Great Wagon Road was swamped in the summer with drivers that smelled like a barnyard, leading and driving livestock to market, aided by shepherd dogs. Entire families road horseback along the road to settle a new farm or found a new church. The Great Philadelphia Wagon Road grew larger and longer, and so did the Conestoga Wagon, ultimately reaching the length of twenty-six feet and a hight of eleven feet. 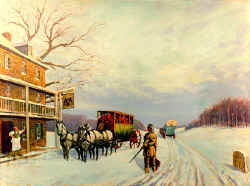 In the early days the Wagon Road was the market for livestock, however the growth of the market towns in Virginia and in the Carolinas gradually diminished the drovers journeys to the City of Brotherly love. The towns that had been way stations for travelers became trading centers; Lancaster, Winchester, Salisbury, and Camden. Few passes cut through the Appalachians and those observed by dense growth of pines and hardwoods which covered the mountain faces. These passes were known to the Indians who found them by observing the course in which the Eagles followed across the mountains; these Scots were slow to find these gaps. The thrift of the Scot- Irish was proverbial; it has been said the Scot- Irish kept the Commandments of God------ and everything else they could get their hands on. The Philadelphia Wagon Road would grow with the years becoming in our lifetimes a part of the interstate highway system. When the crops were in, they started. Early in the morning-even early for farm people, they'd set out. During the first years, they walked, leading five or six pack animals laden with supplies: tools, seed, fabric. In places, the famous path they trod was only three or four feet wide. The wilderness literally crept right up to their feet and brushed their faces as they walked. In later years they marched alongside oxen as these oversized beasts pulled two-wheeled carts heaped to overflowing, crossing rivers that licked high about their animals' flanks and often soaked every single, individual piece of their worldly possessions. Finally, when the path had been worn clear by thousands and thousands of previous travelers, they rode in wagons that, themselves, grew as the path widened into an honest to goodness road. These Pennsylvania- German-built wagons (Conestogas) at their largest would be twenty-six feet long, eleven feet high and some could bear loads up to ten tons. It took five or six pairs of horses to pull them. These big vehicles, the eighteen wheelers of their day, were called "Liners" and "Tramps." Ships would later gain their nicknames. No matter if they walked or rode, in the mid afternoon, they stopped to take care of the animals, prepare food, and put up the defense for the night. The cries of wolves in the distance and the pop of twigs just outside of the firelight sounded danger. Bands of Indians in the early days, bands of thieves later,, chased away deep sleep-no matter how tiring the day, how bone-weary the traveler. The fastest loaded wagon could go about five miles a day. The trip took a minimum of two months. Wagons broke down, rivers flooded, supplies gave out, and there was sickness but no doctors. Wagons were repaired, floods ceded, the wilderness supplied, and the sick were buried or stumbled on. This is the first great interior migration in our nation's history. It's the story of a road, the Great Pennsylvania Wagon Road. Only a few trails cut through the vast forests, which covered the continent between the northernmost colonies and Georgia, the southern tip. The settlers, as they moved inland, usually followed the paths over which the Indians had hunted and traded. The Indians, in turn, had followed the pre-historical traces of animals. Who knows why the animals wandered where they did, but some of those early travelers on that road, the Scots-Irish Presbyterians, would have assured us it was certainly predetermined. Even so, few paths crossed the Appalachians, which formed a barrier between the Atlantic plateau and the unknown interior. In his 1755 map of the British Colonies, Lewis Evans labeled the Appalachians, "Endless Mountains." And so they must have seemed to the daring few who pierced the heart of the wooded unknown. But through this unknown, even then, there was a road. The Iroquois tribesmen of the North had long used the great warriors' path to come south and trade or make war in Virginia and the Carolinas. This vital link between the native peoples led from the Iroquois Confederacy around the Great Lakes through what later became Lancaster and Bethlehem, Pa. through York to Gettysburg and into Western Maryland around what is now Hagerstown. It crossed the Potomac River at Evan Watkins' Ferry, followed the narrow path across the backcountry to Winchester, through the Shenandoah Valley of Virginia to Harrisonburg, Staunton, Lexington, and Roanoke. On it went into Salem, NC, and on to Salisbury, where it was joined by the east-west Catawba and Cherokee Indian Trading Path at the Trading Ford across the Yadkin River. On to Charlotte and Rock Hill, SC where it branched to take two routes, one to Augusta and another to Savannah, Georgia. It was some road, but it was just a narrow line through the continuous forest. Virginia's Gov. Col. Alexander Spotswood first discovered this Great Road in 1716 when his "Knights of the Golden Horseshoe, " finally crossed the mountains, drank a toast to King George's health and buried a bottle claiming the vast valley for the King of England. His Knights' motto became "Sic Juvat Transcendere Montes, ~ or "Behold, we cross the mountains." In 1744, a treaty between the English colonists and the Indians gave the white men control of the road for the first time. By 1765 the Great Wagon Road was cleared all along it way enough to hold horse drawn vehicles and by 1775, the road stretched 700 miles. Boys and dogs, smelling like barnyards, drove tens of thousands of pigs to market along this road, which grew gradually worse the farther South you went. Inns and ordinaries, which spotted the road undoubtedly taught more than a few of them the ways of the world. But that was all later. The majority of the folks who by the thousands would walk over Spotswood's buried bottle would have probably thought his whole 1716 ceremony a little preposterous and quite a bit pretentious. You see, they were plain folk trying to get away from Latin, from mottoes, and from knights with horseshoes no matter their element of manufacture, lead to gold. They were as different from Spotswood's cavaliers as a golden horseshoe is from an ox's hoof. Who were the Wagon Road's Travelers? For 118 years, the English and Dutch settled the New World, lining the harbors and pointing their cities, their eyes, their hearts to the east, across the Atlantic. They were on the fringes of a vast continent but, for the most part, they forever more turned away from it and toward home. They were certainly colonists, even those stem- faced few who came to these shores for religious reasons, and most of the other settlers, you see, had come to expand the business opportunities of home establishments. Their ties to those establishments were strong. It took a different kind of settler, someone who had cut his ties altogether, someone who didn't really have all that much to lose, to look west at a wilderness and there see something more than raw materials ready for exploitation. It took folks like the Germans and the Scots Irish to put their backs to the ocean and see home in front of them. Escaping devastating wars, religious persecution, economic disasters, and all of those other things that still cause people to come to these shores, the Scots Irish and the Germans had no intention of returning to their native lands. They were here to stay. They didn't look east but to the south and west-toward land. They didn't see wolves and Indians. They saw opportunities. And as different as the Germans and the Scots Irish were, they had what it took to flourish in the backcountry. Not possessions that could be lost in the fording of a river, not personal contacts and the sponsorship of powerful men, but rough and tumble ability and a heavy streak of stubbornness. They knew slash and agriculture, they knew pigs, they could hunt and forage, they knew hard work. They built their cabins the exact same way. And eventually, they traveled together in that same heavy stream southward along the Great Pennsylvania Wagon Road. In 1749, 12,000 Germans reached Pennsylvania. By 1775 , there were 110,000 people of German birth in that colony, one-third of the population. When Philadelphia was a cluster of Inns and Ordinaries: the Blue Anchor, PewterPlatter, Penny-Pot, Seven Stars, Cross Keys, Hornet and Peacock, Benjamin Franklin, one of that era's most open-minded men asked, "Why should the Palatinate Boors be suffered to swan-n into our settlement and by herding together establish their language and manners to the exclusion of ours? Why should Pennsylvania, founded by the English, become a colony of aliens who will shortly be so numerous as to Germanize us, instead of our Anglicizing them and will never adopt our language or customs any more than they can acquire our complexion." But the Germans kept coming, thinking like their Scots Irish compatriots who are recorded as noting that!, "It was against the law of God and nature that so much land should be idle while so many Christians wanted it to labor on and raise their bread." In short, Pennsylvania was flooded. There is probably no more beautiful land anywhere than that part of Pennsylvania now known as the "Amish Country." It must have appeared to those people fresh off of the boat, truly a land flowing with milk and honey. But it filled rapidly. Land became expensive. The most important reason why the Germans and Scots-Irish put what little they owned on their backs and took the southbound road was the cost of land in Pennsylvania. A fifty- acre farm in Lancaster County, PA would have cost 7 pounds 10 shillings in 1750. In the Granville District of North Carolina, which comprised the upper half of the state, five shillings would buy 100 acres. The crossing of an ocean was move enough for most of the early immigrants. The generation, which could still feel the waves beneath their feet when elderly, often stayed in Pennsylvania, but their children repeated their parent's adventure. Often, they cast off their lines, raised whatever anchors they had, and ~'sailed" south right after their patriarchs had gone to their reward. As North Carolina's Secretary of State, William L. Saunders wrote in 1886, "Immigration, in the early days, divested of its glamour and brought down to solid fact, is the history of a continuous search for good bottom land." In their search for bottom land, English colonists encroached onto territories claimed by France. This pressure became one of the reasons the French and Indians went to war against England and her colonists. The Germans and Scots bore the brunt of the war, a cabin burning, wife-kidnapping, farm ambushing, bloody, horrible guerrilla war. For eleven years mayhem reigned on the frontier. In 1756, three years after the war started, George Washington wrote that the Appalachian frontiersmen were "in a general motion towards the southern colonies" and that Virginia's westernmost counties would soon be emptied. Western North Carolina seemed to those escaping the war to be safer because the Cherokee were on the British side-at least at the beginning. To western North Carolina they came. This French and Indian War, which started the year Rowan County was created, joined the quest for more and better land as a major factor in sending those Germans and Scots-Irish down the Wagon Road to safer territory. Not only that but, the peace treaty that ended the war stated that no English settlers would go over the Appalachians. Thus, the best unclaimed land in all of the colonies lay along the Yadkin, Catawba and Savannah Rivers between the years 1763 and 1768. When the war ended in 1764, the western settlements of Pennsylvania had suffered a loss of population. Virginia and North Carolina had grown. When those Scots Irish and Germans got here "the country of the upper Yadkin teemed with game. Bears were so numerous it was said that a hunter could lay by two or three thousand pounds of bear grease in a season. The tale was told in the forks that nearby Bear Creek took its name from the season Boone killed 99 bears along its waters. The deer were so plentiful that an ordinary hunter could kill four or five a day; the deerskin trade was an important part of the regional economy. In 1753 more than 30,000 skins were exported from North Carolina, and thousands were used within the colony for the manufacture of leggings, breeches and moccasins." In 1755, NC Gov. Arthur Dobbs wrote to England that the "Yadkin is a large beautiful river. Where there is a ferry it is nearly 300 yards over it, [which] was at this time fordable, scarce coming to the horse's bellies." At six miles distant, he said, "I arrived at Salisbury the county seat of Rowan. The town is just laid out, the courthouse built,, and 7 or 8 log houses built." Most of Salisbury's householders ran public houses, letting travelers sup at their table-and drink, too. In 1762, there were 16 public houses. There was also a shoe factory, a prison, a hospital and armory all here before the Revolution. Even so, it was still only an outpost in the wilderness. Salisbury was for twenty-three years the farthest west county seat in the colonies. And through this outpost the wagon road ran, and on that road the immigrants continued to travel even after the area was settled. Governor Tryon wrote to England that more than a thousand wagons passed through Salisbury in the Fall and Winter of 1765. That works out to about six immigrant wagons per day. This river area now is part of High Rock Lake. And down this road, this glorified overgrown footpath through the middle of nowhere leading to even greater depths of nowhere, came those people looking for a better life for themselves and their children, down it came those settlers, those hardworking stubborn Scots Irish and Germans: the preachers, the blacksmiths, and farmers. When the crops were in, on a day like today, they started. This picture is adapted from the Journal of the Lancaster County Historical Society, Vol. 51, page 68. The Conestoga wagon had broad wheels, the rear wheels being larger than the front, a white fabric hood that was about 12' long and about 4' 8" high, and a convex, from front to back, wagon box which was about 8' 10" long and 3' 6" wide. It was made for a heavy load and with six horses could carry over 7 tons. The Prairie Schooner used on the plains was much lighter. It used two to four horses and the wagon box, with the wheels removed, was floated as a boat. Two hundred fifty years ago our Scotch-Irish ancestors traveling the great wagon road from Philadelphia stopped at the crossroads of two ancient Native American trading paths just east of the Catawba River. There they built a settlement. As friends and neighbors joined them, the community grew. In 1768 the town was incorporated and named Charlotte in honor of the wife of King George III, the reigning English monarch. Local citizens again honored the Queen when they named the new county Mecklenburg after her German homeland. First Scots Presbyterian Church, the fifth oldest church in Charleston, was constructed in 1814. Its design was perhaps inspired by St. Mary's Cathedral in Baltimore, Maryland designed by Benjamin Latrobe. Latrobe was the first professionally trained American architect, best known for designing the United States Capitol. The massive brick Presbyterian Church has walls that are three feet thick and covered with stucco. Twin towers rise above a columned portico. Reflecting the heritage of the congregation, the seal of the Church of Scotland is displayed in the stained glass window over the main entrance, and the decorative wrought iron grilles contain thistles, the symbol of Scotland. First Scots replaced the congregation's first church, a frame building previously located in the southeast corner of the graveyard. The graveyard contains more than 50 stones that date earlier than 1800. The congregation of First Scots dates to 1731 when 12 Scottish families withdrew from the Meeting House, located at the site where the Circular Congregational Church now stands. These members formed Scot's Kirk or the Scotch Meeting House, and were associated with the Presbytery of Charleston and later the Presbyterian Church of the United States. Their first building was finished in 1734 and used for worship until the current church was built. Unique silver and pewter tokens were used for admission to Communion. During both the Revolutionary War and Civil War services were not held. Like many other buildings in Charleston, the church was damaged by the 1886 earthquake, as well as a hurricane the year before. Presbyterians from the North assisted in the restoration of First Scots, and two other Presbyterian churches in Charleston damaged by these natural disasters. Several memorial windows remain that were placed after the earthquake. Recently an English bell made in 1814, the year of the church's construction, was hung in the north tower, replacing the original which had been given to the Confederate army for cannons. 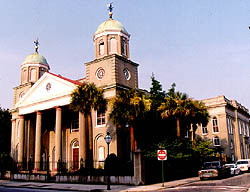 First Scots Presbyterian is one of more than 1400 historically significant buildings within the Charleston Old and Historic District. First Scots Presbyterian Church is located at 53 Meeting St. near its intersection with Tradd St. The church is open to the public. Call 843-722-8882 for further information.